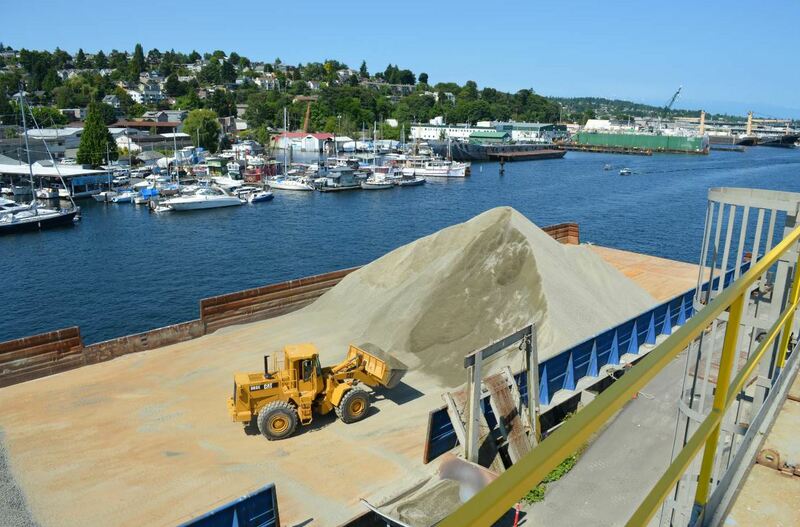 Here the Fremont plant in Seattle takes delivery of aggregate via barge. The asphalt paving industry is diverse in many ways, including ownership and business models. Hot-mix asphalt (HMA) producers include international, national, regional and local companies, each successfully filling the need for production and paving within individual economic environments. Even the country’s largest producer accounts for only about 10 percent of the total HMA tonnage produced nationwide each year. This highlights the fact that there is space in the market for each approach. Proud family-owned companies still thrive and effectively compete throughout the USA. One of the leading examples of the family-owned/regional model of HMA companies has its home in the Pacific Northwest, west of the Cascade Mountains. Lakeside Industries (Lakeside) was first established when Rhoady Lee Jr. and three family members purchased Lakeside Sand & Gravel Co. of Bellevue, Washington, in 1954 (just a few miles east of Seattle). Through persistence in following a well-reasoned business plan, combined with an ever-present commitment to local community values, Lakeside has since grown to be a leading regional HMA paving-centered company with operations in Western Washington/Northwest Oregon that extend from the Canadian border to Portland—a vibrant and developing region along Interstate 5 known as the Cascadia Corridor. This is Lakeside country. Early on, the Lee family developed a business strategy that recognized the potential of the region. From the humble toe-hold of Lakeside Sand & Gravel, Rhoady and his family foresaw the future, with the construction of the interstate running north and south of Seattle, the region along the freeway corridor would experience previously unimagined economic growth. Such is the power of transformative infrastructure. 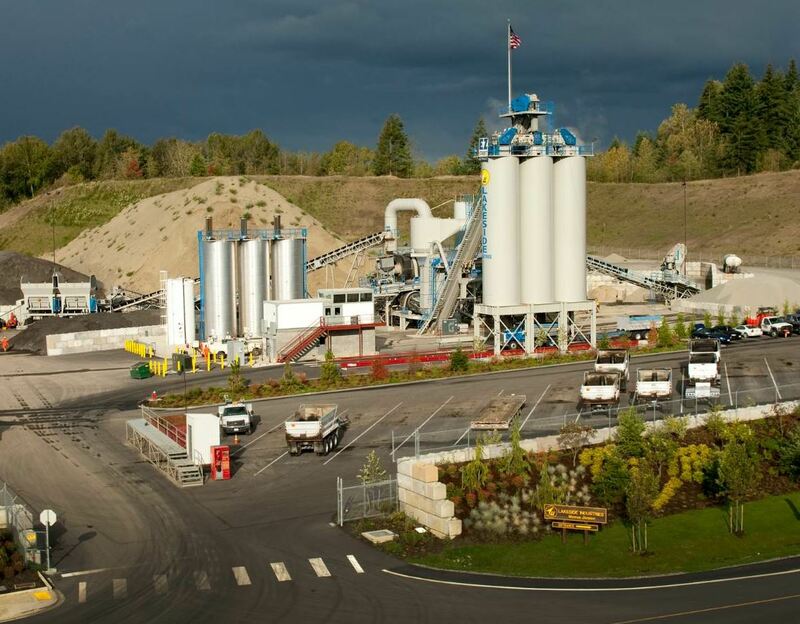 Ahead of other highway contractors, Lakeside set its strategy to establish or acquire community-based sand and gravel/asphalt paving businesses along the I-5 corridor, look for complimentary operations in other population centers in Western Washington, and provide each division the ability to readily leverage resources from nearby sister operations. Over the years, Lakeside consistently implemented its vision, adding locations and talent in a planned, methodical approach that has resulted in a strong, centrally managed corporation that coordinates 11 locally-managed, divisional operations. The Lakeside of 2018 is now directed by a second-generation family board of directors (Rhoady Lee Jr. passed away in 2012). Getting down to business, the crews from Lakeside learn to be the best pavers they can be. 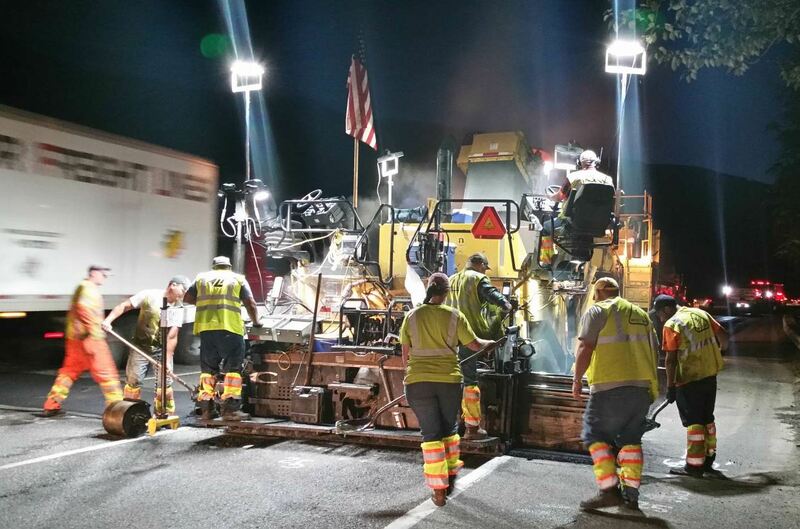 Here a crew participates in night paving of westbound I-90. Check out the compaction wheel getting initial density as they build the joint. Key to the company’s success is that the meaning of “family” extends far beyond Rhoady’s sons and daughters. The company consistently identifies itself as the “Lakeside family,” where second and third generation craftsman and managers pursue their careers along with the company owners. Today, over 700 employees self-identify as members of the Lakeside family. In an industry where changing employers is frequently the norm, the average tenure at Lakeside is 14 years, with many dozens of employees experiencing life-time careers at the company. Lakeside has consistently been an industry leader as the company has matured. It was one of the first paving companies in the region to employee a full-time safety professional circa 1961. (This is now a full-time Risk Management & Safety Team of seven). Similarly, Lakeside created a full-time Environmental & Land Use Program Management position in 1993 to professionally navigate the company’s pit and plant site permitting, regulatory compliance, site reclamation and land development. The efforts continue. 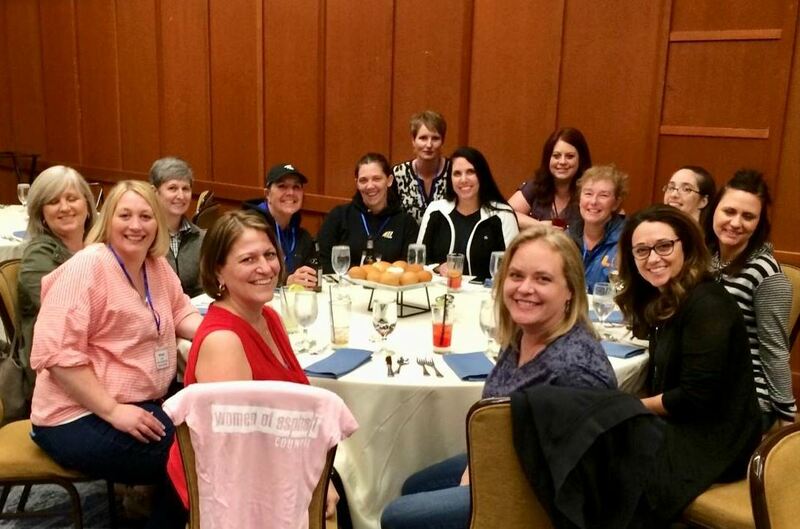 In March 2018, Lakeside sent a contingent of its career track women from throughout the company to the World of Asphalt show in Houston to attend the inaugural Women of Asphalt Council event. These women then started their own peer-to-peer group—dubbed the Lakeside Ladies League (L3)—to begin to build upon the national effort at a local level and to even more actively provide support for the women currently managing Lakeside’s front-line business activities. Lakeside is also a leading promoter and partner of regional craft apprenticeship training programs and it runs a stand-alone college internship program that typically offers six to 10 boots-on-the-ground opportunities each year to college underclassmen and recent graduates from a host of regional universities. Lakeside also actively works to highlight the industry through plant tours. Division managers host educational tours at their plant(s) to introduce elementary and junior high school students to this vibrant local business that is often hidden in their midst. These tours serve to acquaint a new generation of potential future employees to a critical home-grown industry with jobs that can lead to rewarding careers, with or without a college degree. Young students stopped for a photo opp during a field trip to a Lakeside plant. One of the unique ways that Lakeside continues to extend its corporate values is the commitment of the Lee family to reach out and listen to their team members. To that end, for the last several years, Mike and Tim have committed themselves to have breakfast with the employees at each divisional office at least once per year. It’s one way they feel they can continue to connect with the Lakeside family and to keep in touch with the concerns of people at each division, on a personal basis. While the investment of their time is substantial, the fact that folks from every facet of the company can sit and talk with the owners of company, sharing their triumphs and concerns on a personal level, is important to Mike and Tim. 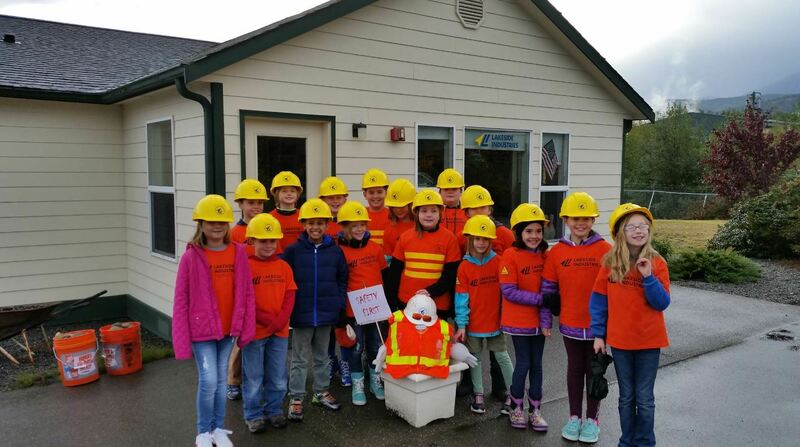 In 2016, students from Centralia Elementary School go a tour of a Lakeside asphalt plant. The company believes in educating the next generation and showing what career opportunities are available to them in our industry. And there are practical results from these breakfast visits. Lakeside’s “What’s Your Exposure?” safety program, using its unique “Why WYE Mom?” children’s book (see the June 26, 2017, AsphaltPro article), was inspired by the 5-year-old son of a Lakeside employee. More recently, a question challenging Lakeside to help educate the public about distracted driving prompted Tim and Mike to urge NAPA to accelerate and enhance its safety outreach. One of the products from this challenge is NAPA’s national “Watch for Us” campaign, which you can review on www.Watchfor.us. Closer to home, Lakeside also committed to a new effort to engage with the Washington State DOT (WSDOT) specifically on the unique aspects of paving work zone safety. Coordinating with WSDOT and WAPA, Lakeside helped to create an entirely new co-sponsored safety effort with very high level WSDOT support. 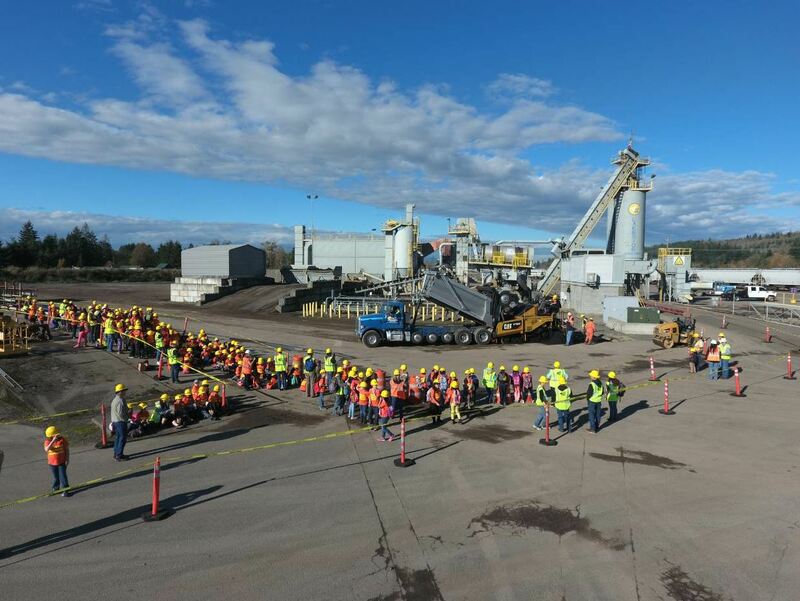 One result of the effort is the “No Distractions—Lives are on the Line” video produced by WSDOT, and the accompanying social media campaign that is in full swing during the 2018 paving season. The video is being widely circulated and can be seen on WSDOT’s Facebook page. At this year’s divisional breakfasts, Mike and Tim can say with pride that Lakeside stepped up to lead new efforts to educate the traveling public about distracted driving and mobile work zone safety. 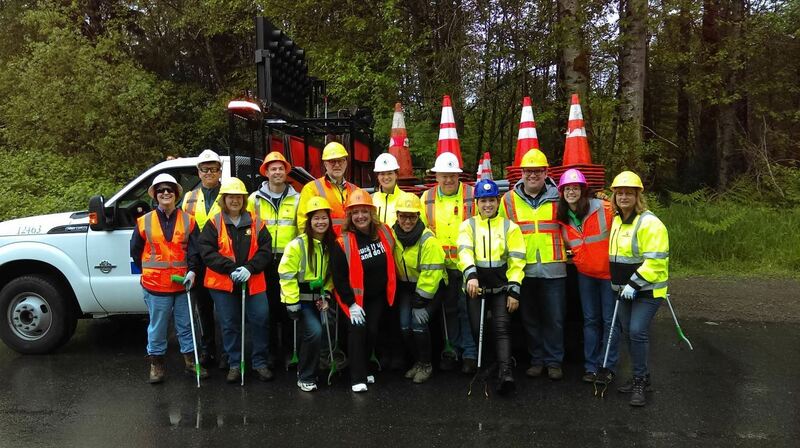 Volunteers from Lakeside participate in community events such as Adopt-a-Highway cleanup efforts. Lakeside is also a leader in promoting the broader HMA industry. It is a long-time member of both the Washington and Oregon Asphalt Pavement Associations (WAPA and APAO). Rhoady Lee was a two-time WAPA president and was inducted into the WAPA Hall of Fame in 1996 in recognition of his long history of industry leadership. Both Tim Lee and his brother Mike (the current president of Lakeside) have served as WAPA’s president. Additionally, four key company managers have served a combined five WAPA presidential terms and Lakeside’s Portland division manager sits on the APAO board of directors (BOD). Tim has served for several years on the National Asphalt Pavement Association (NAPA) board of directors and he is currently NAPA’s treasurer. Both Tim and Mike have led the WAPA contingent at the Transportation Construction Coalition Fly-in in Washington, D.C., for 20+ years. In short, the Lees are committed to advocacy for their industry and they work tirelessly to champion infrastructure investment though direct engagement. Over the years, Lakeside consistently implemented its vision, adding locations and talent in a planned, methodical approach that has resulted in a strong, centrally managed corporation that coordinates 11 locally-managed, divisional operations. All photos courtesy Lakeside Industries. Lakeside has been operating in many of its communities for decades and it prides itself on continuous strategic investment in its plants and equipment. Each plant is well maintained, retro-fitted, updated or replaced to fit the projected needs of each division. Lakeside’s 1,000+ pieces of heavy equipment include dozens of current generation pavers, multiple material transfer vehicles and a state-of-the-art fleet of rollers. Lakeside also runs a first-class trucking operation. The result of the community values that Lakeside espouses is evident in the multitude of awards and honors the company has garnered over the years. Recent examples include the 2017 Business of the Year for Lakeside’s Olympic Peninsula division along with multiple NAPA, WAPA and APAO quality awards in just the past few years. Visit any of the Lakeside divisional offices and you’ll see dozens of paving awards lining the office walls, along with a wide variety of community, environmental and business service awards. Look outside and you’re likely to see a giant NAPA Diamond Quality Achievement logo painted on the plant silos. You soon realize that each division works every day to continue the commitments to quality and community that continue to garner these honors, year after year after year. In each of its communities, Lakeside is a well-respected business leader where pride of ownership and local engagement are paramount. While there are many ways to prosper in the wide world of asphalt paving, Lakeside shows there will always be a place for well-run, family-directed companies to thrive. David Gent is the executive director of the Washington Asphalt Pavement Association.